We have finished the first week of the Easter holidays and it has flown by. I'm hoping that week two goes a little slower. We started off the holidays with Easter and a lovely five day weekend with Mark at home, I wish he could have off every holiday with the kids but that just isn't possible. He did manage five days with us because of the bank holidays and then her took an extra day for my birthday. I've never eaten so much, Easter followed by a birthday! We had a lovely Easter, we didn't do much but saw some special friends, family and ate a lot of chocolate. We also had snow! Not enough to play in but enough to slow everyone down. My birthday was ok, we went out for lunch and then had a little buffet at home, sadly the candles for the cake were forgotten but we improvised and made it work. Then daddy had to go back to work and it was just me and the three terrors. It honestly flew. We had a bit of a rainy day so played inside, snuggled and just had quite a lazy day which was lovely after a busy Easter and birthday. On Thursday we had a whole day of sunshine, it was heaven. We spent most of the time in the garden. I cleaned off the trampoline so the kids could jump and I managed to tidy up the garden a little. Does anyone else let the garden go during the winter?! 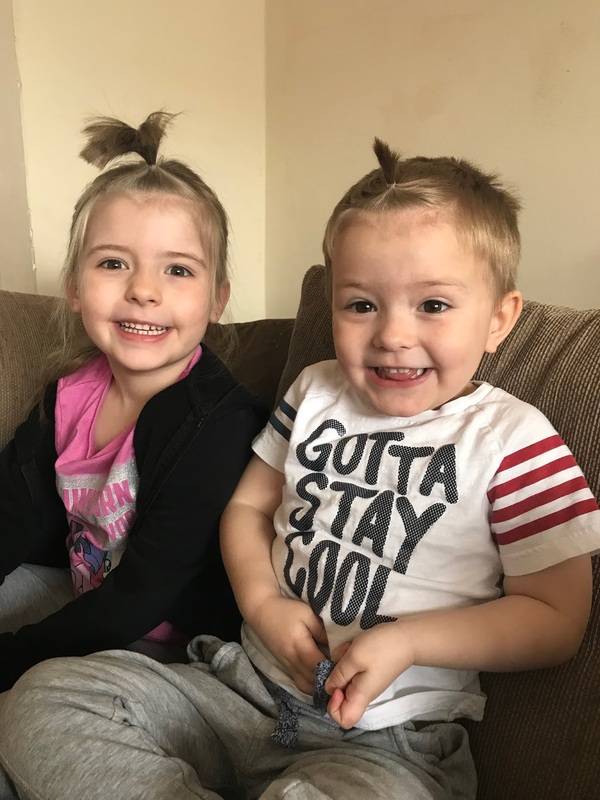 On Friday we had friends over in the afternoon and in the morning we dressed up, played games and did each others hair, the big two wanted to be like Harleigh. So cute! We have a few plans for next week and I'm hoping we get some more nice weather as it was lovely. We are all ready to be outside more and eagerly await spring.